Situation Update: On the evening of the 28th of January members of the Iranian military have declared that they no longer observe their service to the government and have declared Jask county become its own state. If their demands for Jask county to become a sovereign state are not met they have vowed to use alternative means to ensure their independence. With a silk worm battery under their control there is growing concern that the separatists will use it against commercial shipping traffic in the Strait. The 294th have been tasked with striking strategic positions inside and around Bandar-E proper in the early morning on the 29th. Threat and potential target assessment: Local agents have reported there has been increasing activity levels at a silk worm site located on the western side of the county as well as large numbers of truck shipments into Bandar-E-Jask where they stop at a large compound north of the airfield. They are unsure of what the contents of the trucks are but have hint that weapons could be in the process of being shuttled into the city. What is known for surface to air threats is an SA-8 and SA-9 have been moved to guard the airfield as well as multiple AAA emplacements. It is unknown at this time if any SA18's are in possession of the separatists. Ground targets on the ground include a centralized command and control center that the separatists have setup in the center of the city. An ammunition and motor pool located in the outskirts of the city. Due to the proximity of civilians in the city - only precision guided munitions have been authorized. The Iranian government has declared a state of emergency and has made public statements that they wish to handle this internal matter on their own and that any trespassing of their airspace will be met with a swift response from the IRIAF and their air defense network. TASK: Destroy strategic targets located inside Bandar-E proper in support of a helicopter landing force arriving after the air-defense network is knocked offline. Targets of opportunity may be attacked but only after the primary (SAMS and AAA) are taken offline. NOTE: This mission will require me giving you guys 9-lines and I promise this stuff isn't difficult at all. It looks it, but for the most part I am guiding you through it. Other than the initial 9-line, all the ones following it will either be a talk-on or an abbreviated 9-line. The abbreviated would be lines 4 & 6 which would be the elevation and the location of the target, whether that is visual by a IR pointer mark or by a given DMS coordinate pair and any restrictions I give you. Flight Leads you will be checking in with the AFAC at WYPT 5 or sooner if I call for it once I am set-up. 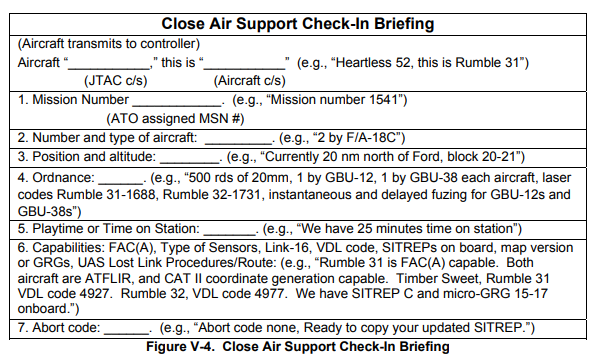 For the sake of simplicity you can call me with, "Tusk1, Pontiac1 ready check-in", "Pontiac1, Tusk1, go with check-in" I have no plans on doing authentication because we're just going to dip our toes into the water with AFAC this time around. At that point you will simply read off this form here with everything you've filled in because you're an awesome flight lead. IE: Tusk 1 this is Pontiac 1, Mission number 14033, 4 by F-18C, currently holding over WYPT 5 at twenty-thousand. We have X gun, 2 by GBU 12 and 1 AGM65E for each aircraft, laser code 1511. We have a playtime of 30 minutes. We have night vision equipment, and moving map. Abort code none. Ready for your sitrep. ^ Pontiac 1 lead just got a freebie. Chevy can replace the mission number with the one in their briefing card. At this point I take over the radio for a while and I spout off some stuff about the situation on the ground at no point do you need to readback anything about the situation or the following gameplan. at the end of the situation update I will then you, "ADVISE READY GAMEPLAN" you will then respond, "Pontiac 1 is ready gameplan" or some variation of that. I will then inform you that you will be under Type 2 control (IE I don't need to see you to give you the clearance to release the bomb), what kind of attack it will be, bomb on target, bomb on coordinate etc. I will also then spout off some nonsense about how I'm going to use and abuse you for the next 30 minutes or so and will end the gameplan with, "ADVISE READY 9-Line". 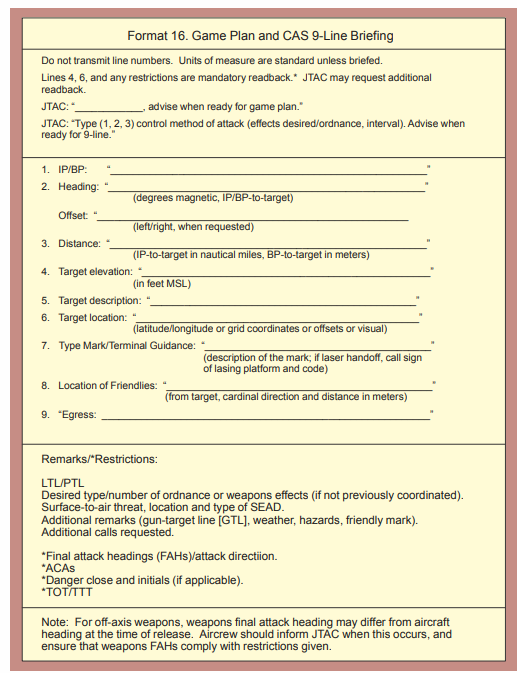 You better have a piece of paper ready or the VR scratchpad available to you as this is where all of your info is coming from for how to hit a target. I will not transmit the line numbers so you won't hear me say, LINE 1 WAYPOINT 5, LINE 2 HEADING 270 etc. Lines 1,2, and 3 I will probably not use because we all know where the IP is, what direction to fly to get to the target, and the rough distance. Example 9-line. Everyone will need to know how to take one of these and read it back! Tusk1 - Pontiac 1-1 1,2, 3 N/A (means you can skip those lines on the sheet and go straight to 4) 400ft MSL, SA-8, N59 25 06, E025 13 95, Mark Sparkle, N/A, Right pull back to WYPT 5. Advise when ready to copy remarks. Tusk 1 - SA-9 2 klicks north of target, multiple triple a within 2 clicks of target on the north, south, and west sides. Tusk 1 - Pontiac 1-1 readback correct call in with heading. and you're done. You just need to call when you're IN and the heading, at that point I will give you the sparkle, laser and a cleared hot, or cleared dry. Also please let me know when you release the weapon so I can start looking for the impact / start staring out my window for any potential launches or AAA. From that point forward I shift to giving abbreviated 9-lines with the remarks or if it's really far away I will need to give you a full 9-line (no check-in, gameplan, situation update etc).